Considered a smaller, more intimate version of Las Vegas, Reno, Nevada, has all the glitz and glamour you could want. It’s a great place for a family vacation and has better access to outdoor adventure than Las Vegas. If you’re on a tight vacation budget, you can save money by finding cheap hotels in Reno such as the Silver Legacy Resort Casino where you get top-quality gaming and reasonably priced rooms. Here are five ways to save money in Reno and still have a great vacation. 1. Free Movies – there are free movie venues around Reno and Lake Tahoe that provide free family entertainment. You need to check what movies are showing as they aren’t all family-friendly. The main venues are the Washoe County Library, the University of Nevada, Reno campus and at the Wingfield Park, Artown event in July. The Fleischmann Planetarium and Science Center offers movies at discount prices. It is located at the University of Nevada campus and is the world’s first planetarium to show full-dome movies. 2. Choose accommodation in the outlying neighborhoods – downtown Reno has up-scale casinos, hotels and resorts that can be a bit pricy during the season. You may be able to get lower rates in the luxury hotels during the off-season which is usually spring and fall. However, you can always get budget accommodation just outside the downtown district. There are low-cost motels near the Reno-Tahoe International Airport, and many of these are conveniently located for outdoor activities in the mountains or Lake Tahoe. 3. Find the cheap buffets at casinos – the major casinos offer all-you-can-eat buffets for very low prices. This is a good option for anyone, but if you have a hungry family, this will save you a lot on eating out. If you stay at a vacation rental or Airbnb accommodation, you’ll have a fully equipped kitchen and can cook your own food. At restaurants, dinner is usually more expensive than lunch, but it has the same menu. You can eat out at lunch and cook dinner and breakfast at home. This will save you a lot on food costs especially if you shop at the numerous farmers’ markets and discount food markets. 4. Car rental – only rent a car for the days you want to go out of town. It you plan to visit Lake Tahoe or the Sierra Nevada mountains and go hiking or biking, you’ll need to rent a car. However, while you are in town, use the excellent public transportation. Reno’s public transportation system is easy to use and will take you everywhere in the city. The Sierra Spirit is a free bus line that will take you all over downtown and also goes to the University of Nevada. 5. Free parks – Reno has many parks that offer a great time for everyone. The Wingfield Park is on the banks of the Truckee River and has kayaking, tubing, swimming and other water sports. Virginia Lake Park has a playground for children and miles of walking paths. There is also a dock for fishing. Rink on the River offers ice skating during the winter and offers free lessons. Along with its world-class gaming, Reno has many other charms and attractions that don’t cost a fortune to enjoy. If you find cheap accommodation and food, you can have a great time with the money you save. 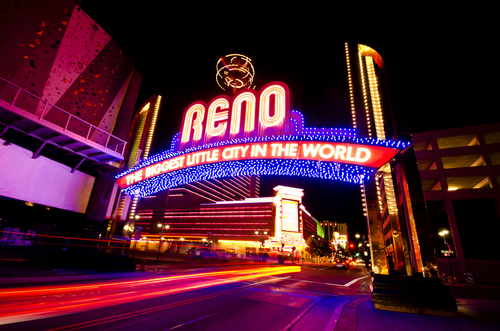 Have you been to Reno? Rachael Ray 14-Piece Hard Enamel Nonstick Cookware Set Only $99 (Reg. $290!) + FREE Shipping!